Well, I did my best.....and I don't think she turned out too bad. Not pretty....but thats ok. Here's the begining and end of the painting stage.......yes, its the same doll! Wow this is a beautiful doll. Looks perfect. Great work Linda. She looks so lovely sitting on your mantelpiece. It must be so much harder working in 3D than on a flat sheet of paper. No wonder you are pleased with the result. I like her. She looks right at home in front of the roses. She looks so different. Amazing what we girls can do with a bit of make up and clothes! She turned out lovely. She fits right in on the mantle. Your painting has transformed her! Come on, she's wonderful for your first try! She looks Spanish and has the kindest look in her eyes. She would tell the most interesting stories about her life, how could she not with those expressive eyes? Linda - Grace is wonderful! She has turned out beautifully. Can't believe she is your first clay doll. Gorgeous colors - love her dainty feet. And she looks very at home on the mantle. You always inspire me lovely Linda! what a great job she looks lovely! ooo she is gorgeous!!! well done! Linda, I do love her! She has a certain presence and beauty all her own. We can be so critical of our work sometimes, I know. But I can't even imagine doing this myself, and you have done it...and done it very well! Hooray for you! Love the closeup views. She has a primitive art look to her, there is quite a movement here in the US...in the UK too? I would be over the moon if I had created something like your Grace! She is lovely and she is sitting there on a good place . Fantastico!!!! I can just imagine what your dolls will look like when you keep this up. It is lovely to see how many talents you have. 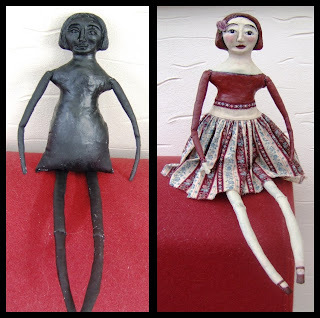 I have a real soft spot for clay dolls so keep going I would love to see more. By the way I have joined the Goddes and poet class...yeaaah. Linda you are so clever... I love your doll, she is very beautiful! You are amazing, Linda. I knew even at her awkward stage that she would turn out beautiful! That doll is so beautiful. What did you use to make it? I look longingly at Du Duh Bu dolls and this has the same sort of feel. Its lovely. Linda she is sooooooooooooo Stunning ,You are so talented you truly are .I love her skiny legs and little shoes she is Amazing . I would love to see you make a Freida Doll . Sorry I haven't been over much lately . I don't think pretty would have suited her. She looks as if she's seen a lot in her life and is wondering how to make sense of it. What a great job you've made of her and I love the name/title! She looks so lovely, sitting on the mantle. I really do like her and I would like to try one. But ... I've said that before and I never do. I wish I could find a class close. She says Grace for sure. Super job! Chunky ATC Challenge and More Gifts!